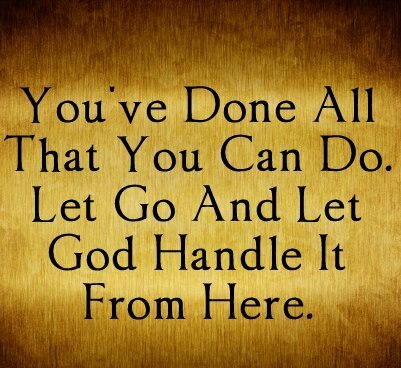 Or you can live by trusting God. Or you can believe God will make things happen. I trust that God will take care of me if I take care of myself in all of the ways that I can. I trust that He sees me and will answer my prayers. Trust in God is the only way to get through each day. I think that we are in a complimentary mode with God. We can do the best that we can do and when that doesn't work (which is often), then we have to trust in God. Because OUR way didn't work. I made things happen by quitting smoking. Just like you did. The "God takes care of those who take care of themselves" thought is what makes sense to my brain. I don't think you give up taking care of yourself because you assume God will take care of you. God has enough to take care of, so the more we can do that for ourselves the better. I believe we can make things happen. We are made in God's 'image," right? We are co-creators (well, lessor creators) but creators nonetheless. I don't agree with you that it's an either/or situation. I think we create together. He gives the brush, the paint, the colors, enables us to create the painting, he tweaks it along the way and then frames it. As the ULTIMATE ARTIST, we can learn from Him, follow his lead, but by giving us free choice, we can create our own painting. And there are so many diverse and beautiful paintings out there. Yes I trust MY Daddy God-MY Lord Jesus-MY Holy Comfortor-it is written-the fullness of the deity in Christ in ME-I know for ME it is ONLY by Gods grace by Holy Spirit working in ME by Christs faith in ME now to eternity-NICOTINE FREE-MY action-NEVER TAKE ANOTHER PUFF EVER-Gods promise in Christ finished work on the Cross for ME through Christ in ME-it is written -I am the righteousness of God in Christ by faith-in a nutshell-The right thing for ME is N.O.P.E. since it is written i am Christs and Christ is Gods-they dont use DRUG NICOTINE- i would be wise to do the same-MY obediance-NEVER TAKE ANOTHER PUFF EVER OVER ME-amen-for ME-MY decision-BELIEVE-TRUST-OBEY! in MY Lord Jesus name amen and amen HOORAY FOR HOLY SPIRIT DOING ALL INNER AND OUTER WORK IN ME! Thanks Thomas for your blog of ACTION and walking your belief in our Daddy God-Christ VICTORY in US-WE ALREADY WON! I know for ME BY BELIEVING-TRUSTING AND OBEYING MY HOLY COUNSELOR IN ME I KNOW THAT JESUS BLOOD IS RUNNING THROUGH MY VEINS CLEANSING ME FROM ALL UNRIGHTEOUS-in MY Lord Jesus name amen. YAHOO! MY pray-Lord come quickly! Amen!